Alan Walsh was born on 19 December 1916 and brought up in Hoddlesden, a small moorland village in the borough of Darwen, in Lancashire, England, about twenty miles north of Manchester. He was the eldest son of Thomas Haworth Walsh, who managed a small family cotton mill in Hoddlesden, and Betsy Alice Walsh (nÃ©e Robinson). The family cotton mill, Vale Rock Mill, Holden Haworth Ltd, was one of two mills that employed most of the people in Hoddlesden and many from the next town. Alan’s father, Thomas, was an astute and remarkable man who managed the mill for 52 years, including the period during the late 1920s and 1930s when the cotton industry was badly hit by the depression. Thomas had the interests of his family at heart but laid down the rules and would not allow disobedience of any kind. Alan’s mother, Betsy, was a charming, warm-hearted woman. Alan was very like her in some ways but his astuteness and determination came from his father. The village was quiet: just one pub, a school, a church and a village shop, which Alan’s grandfather, Benjamin Walsh, ran and which sold everything from meat, vegetables and groceries to clothing. Benjamin was a friend and helper of the vicar, and had a big say in village affairs. Alan’s grandmother, Mary (nÃ©e Haworth), was a strong-minded woman of the old school who insisted on good manners at all times. I had no idea where I was headed during secondary school. In fact when I was 16 years old I was advised to do French, English and History and drop Science. At the time I was having trouble with eye strain and because I thought French, English and History would involve a lot of reading, I chose rather to study Mathematics, Chemistry and Physics in which I performed quite wellâ€¦ At that stage I was very uncertain about my next step. I remember being attracted by a teacher training course, but my headmaster had other ideas. He finally spoke to my father and they persuaded me to apply for the honours course in physics at the University of Manchester. I had been at university only two weeks when I attended a lecture by Lawrence Bragg. In this lecture to the University Physical Society he told, in extremely simple language, the story of the pioneering work he and his father had done in their development of X-ray methods for determining the structure of crystals. The basic simplicity and beauty of their contribution greatly impressed us freshers: the drama was enhanced by the knowledge that their work had been of such outstanding merit that they were awarded the Nobel Prize. In the first place I was to work on the development and application of spectroscopic (emission) methods of metallurgical analysis, about which I virtually knew nothing, but with the intention of also, in due course, working on X-ray studies of metals. With the outbreak of war (on the day he was due to start), these plans were abandoned and for the duration I worked only on spectroscopy. During World War II, Alan was unable to join the Services because of his metallurgical occupation, but he undertook part-time service in the Home Guard, where ‘he was put in the mobile cavalry (bicycle section), being of the athletic type. He had represented Manchester at tennis’. Alan Walsh was awarded the degree of MSc (Tech) in 1944 for a thesis entitled ‘An X-ray examination of ÃŸ-carotene’. In 1960, he was awarded a DSc from the University of Manchester for his contributions to atomic and molecular spectroscopy. Alan set sail for Australia via the USA, where he visited a number of companies and laboratories to see the various items of spectroscopic equipment that Lloyd Rees had ordered for the new spectroscopy laboratory at CSIR and arrived in Melbourne in April 1947. In the period 1947-51, Alan worked on infrared molecular absorption spectroscopy and atomic emission spectroscopy before switching to atomic absorption spectroscopy for the rest of his career at CSIRO. He retired from CSIRO in 1977. Upon commencing at CSIR Alan set about installing the new Perkin-Elmer Model 12B spectrometer, thereby establishing his first interaction with the Perkin-Elmer Corporation. This was the first operating infrared spectrometer in Australia, and there was a steady stream of requests for service and collaborative work from organic chemists both within the Division and outside it. Alan was particularly interested in understanding the mechanics of the technique and studying the structure of small molecules. Together with Arthur Pulford, an MSc student from the University of Sydney, he studied the vibrational spectrum of nitrosyl chloride (NOCl) and calculated its geometry and thermodynamic properties. The best spectra were obtained late at night or in the early hours of the morning. It was therefore a memorable occasion, which substantially improved my quality of life, when our Model 12B was converted to a Model 12C. This incorporated a fast thermocouple, which permitted the use of a modulated light source and a synchronous AC [alternating current] detection system and completely removed the problem of drifting base lines. Recording infrared spectra was transformed from a chore to a pleasure. Alan soon realised that the resolution of the Perkin-Elmer (prism-based) spectrometer was quite inadequate for resolving the rotational lines of any but the lightest molecules, and even in these cases the full details of the spectrum were not revealed. To improve the resolution he devised a simple and elegant modification of the infrared prism monochromator in which radiation was passed two or more times through the same optical system. To do this he placed a pair of right-angle mirrors at the exit slit of the spectrometer to reflect the radiation back through the prism and, to isolate the desired multiple-pass beam from the other beams, he placed a rotating ‘chopper’ in front of the additional mirrors to modulate only the multiple-pass light and fed the output of the thermocouple detector to an amplifier tuned to the frequency of the chopper. An additional advantage of this modification was that the level of stray light, hitherto a major problem in infrared spectroscopy, was reduced dramatically. Alan’s ‘double-pass monochromator’ was patented in 1950, with coverage in Australia and eight overseas countries. Perkin-Elmer, the world’s major manufacturer of infrared spectrometers, secured an exclusive licence and in 1953 began manufacturing a kit of ‘Walsh Mirrors’ to allow the conversion of their standard infrared spectrometer to a double-pass monochromator system. This experience with patenting and licensing and the interaction with Perkin-Elmer had significance for future events in that it involved Alan personally with the commercial aspects of scientific investigation. It is interesting to speculate whether Walsh would have invented atomic absorption analysis if the source unit had been successful and allowed the planned research on inter-element effects to proceed. The frustration of the planned emission work stimulated him to think more and more about the tremendous number of sample atoms in the ground state, compared with the few, sensitive to minor changes in electrical and other conditions, in excited states. Details of Alan Walsh’s outstanding research in atomic absorption can be found in Peter Hannaford’s 2000 memoir of Alan Walsh (available by following the link in the Sources below) and the CSIROpedia entry Atomic absorption spectroscopy. I have pleasure in informing you that Her Majesty The Queen has been graciously pleased to approve the recommendation that you be awarded a Royal Medal in recognition of your distinguished contributions to emission and infrared spectroscopy and your origination of the atomic absorption method of quantitative analysis. Alan had the distinction of being only the fourth Australian scientist to have been awarded a Royal Medal, after Ferdinand von Mueller in 1888 and Nobel Laureates Sir Macfarlane Burnet and Sir John Eccles. In the Silver Jubilee Queen’s Birthday Honours List in June 1977, Alan was created a Knight Bachelor for ‘his distinguished service to science’. 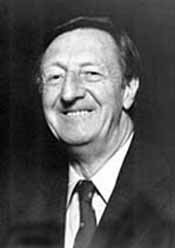 Alan’s many other honours included election to Fellowship of the Royal Society of London in 1969 and Foreign Member of the Royal Swedish Academy of Sciences in 1969, being only the second Australian scientist (after Burnet) on whom the latter honour had been bestowed. Alan Walsh did not only invent an analytical instrument called the atomic absorption spectrophotometer ‘ he created a field of scientific work in atomic absorption spectroscopy and initiated and cultivated its application to elemental chemical analysis in areas as disparate as agriculture and chemical industry, and medicine and the mining and metallurgical industries. His contribution to science, industry and human welfare has been enormous. In spite of his great distinction Alan Walsh is a human being ‘ he enjoys life and has never found it necessary to develop eccentricities or affectations. He died in Melbourne on 3 August 1998, aged 81.